Whether you’re having friends over for dinner, heading to a potluck, or are on side dish duty for a game-day event, you can keep it keto with delicious low carb recipes. Keto side dishes are healthy and flavourful, the perfect addition to any main meal. And with mouth-watering flavours, these dishes will do you well. 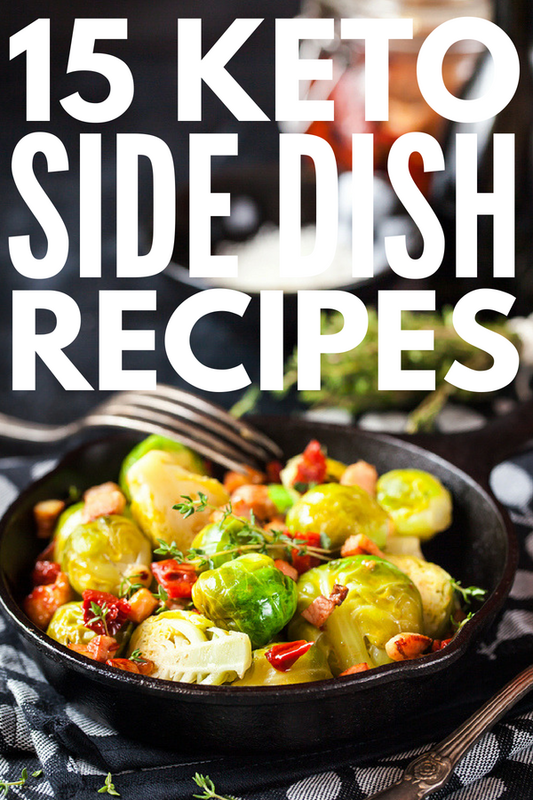 Read on for quick and easy keto side dishes that are delicious, healthy and will help you lose weight! A basic overview of the keto diet is simply this: Your body burns fat instead of carbs. Before explaining the keto diet, it’s important to explain how our bodies are fuelled. Naturally, your body burns glucose for energy, and this glucose comes from carbs. If that glucose store is unavailable, your body has to look for another fuel source. The keto diet is a high fat, low carb meal plan that forces your body into a metabolic state called ketosis. During ketosis, your body burns stored fat instead of glucose since it can’t find any glucose due to the elimination of carbs. The keto diet is very high in (good) fats, some protein, and minimal carbohydrates. How Does the Keto Diet Help with Weight Loss? The keto diet is one of the most effective and efficient ways to lose weight and keep the fat off for good. So, how exactly does it work? A typical Western diet is made up of lots of carbs. This isn’t just necessarily carb-heavy foods like pasta and bread, even fruits and vegetables have carbs. When you eliminate carbs, the body starts producing ketones (that comes from fat) as an alternative fuel source. It takes a few days for your body to reach ketosis, but once it’s there, it’s essentially burning fat all the time, whether you’re sleeping, working or exercising. Pssst. Does this sound too complicated? Here are 5 steps to ensure your transition to the keto diet goes smoothly. Check out this post for a list of foods you can eat on the keto diet, and more importantly, foods you should avoid. If you don’t keep the bad-for-you foods in your house, it will be much easier to stay true to the keto diet. Get rid of anything in your fridge and cupboard that may tempt you, and create a keto grocery list to restock! One of the biggest problems when it comes to the Western diet is over-eating. Even when you’re eating keto-friendly meals, it’s still possible to over-eat. Be mindful of how much you’re eating and keep your portions reasonable. Often times people don’t stick to diets because they feel deprived. There are so many delicious keto recipes out there, so you can substitute your favourites for something keto-approved. If it isn’t already, Pinterest will become your new best friend! If you haven’t heard of the keto flu, here’s a run-down. Make sure you know the symptoms and be prepared if they start showing up. Seek comfort in the fact that they will pass and be prepared to take care of yourself. These stuffed portobello mushrooms are the perfect keto friendly side dish to serve with your main meal. Filled with low carb, high fat goodness like cream cheese, parmesan, and mozzarella cheese, these are sure to be a hit! Cauliflower is one of the best low-carb veggies, plus it’s chock full of vitamin C. Seasoned with garlic, paprika, black pepper, and parmesan, it’s a great low carb side dish for any occasion! This super simple recipe, made with cabbage, lemon and olive oil is ideal when you need a keto side dish in a jif! Prep time is only five minutes, and then you pop them in the oven and let it work its magic! If you’re a fan of spinach, you’re going to love this creamed spinach side dish. With 7 ingredients and made in just 20 minutes, you’ll get this delicious oozing dish that packs a punch. Even non-spinach eaters will devour it. Brussels sprouts contain a low to moderate amount of carbs, so they’re perfect for the keto diet, just don’t go overboard. Mixed with lemon, sun-dried tomato, and a blend of spices, it’s a side dish everyone will love. When you have friends over in the summer, all you want is a quick easy side dish to whip up. These ultra-easy grilled veggies are marinated in Italian salad dressing, seasoned with herbs, and ready to pop on the BBQ! This pairing of perfectly grilled bacon and shrimp will explode your tastebuds and leave your guests wanting more! Flavoured with hoisin sauce, chipotle powder, lime juice and sweetener, this is one of the tastiest low carb keto side dish recipes around. Ribs are always a fan favourite, and this low carb bbq rib recipe won’t disappoint. Covered in dry mustard, paprika, cayenne pepper, and black pepper, these ribs are perfect for an afternoon bbq. These boozy lamb bbq skewers will make your guests swoon. Paired with a tasty chimichurri sauce, made with fresh herbs, lemon zest and red pepper flakes, this keto side dish stands on its own! Featuring chicken, bacon, cheese, bbq sauce and jalapeno, these bbq chicken bombs are the quintessential keto bbq side dish. Ideal for a game-day event, or a big family get together, these chicken bombs are going to have raving fans. These flavourful fritters are super simple to make, and packed with delicious ingredients like sugar-free bacon, garlic powder and black pepper, they’re incredibly addicting. Low carb and gluten free, it doesn’t get much better than that! The perfect keto finger food to snack on before or alongside your main meal, these zucchini fries are the way to go. Breaded with ingredients like paprika, onion, and cayenne powder, these fries pack a punch! A healthy rendition of tater-tots, these baked cauli-tots are made with cauliflower, and are baked, not fried. They’re great to serve on the side of any keto dish and have an amazing texture your gang will love! Deviled eggs with avocado and bacon? Count me in! This side dish is flavoured with cayenne pepper and taco seasoning. She even uses avocado mayo to keep it dairy free. They’re quick and simple to whip up, and you can make a whole batch depending on your party size! Coleslaw is a delicious side dish, especially for a main like a hearty hamburger. To add a twist and some flavour, throw in some fennel seeds and dijon mustard! If you’re throwing or attending a gathering, these side dishes are the perfect addition to any meal! Whip them up and you’re sure to make all your guests’ mouths water. If you loved these keto side dishes, please share this post on Pinterest. And if you want more keto recipes, please follow our Health Board on Pinterest.